Polk Audio RM7500 speakers. All 5 channels work as they should and look great, just need to be shined up. Does not have a sub. These were Polk's TOTL sat/sub HT setup, and have not been bested by anything similar in Polk's lineup or their competitors. I will be forced to toss them if there are no takers. Ugh. I’ve always wanted these. I love mine. Very versatile and look great. I have one that's damaged. Would you ship them for shipping and handling? If no one local takes them. My center of this set got broken when moving. Miss it. Would be a crime to toss them. If you ever get into Chicago, I'd love to take them. Feel the peer pressure, FEEL IT!! Talk to me John. Could find a use for thrm. Yes, they will work with another sub... I am going to give them until Friday to find a home local. They are HEAVY, and I would expect that packing them properly and shipping them would be cost prohibitive, but am willing to do it if whomever wants them is willing to pay for it. 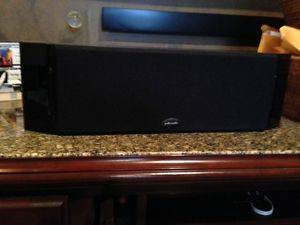 I think @ken brydson owned these speakers once upon a time and he was very happy with them. Great karma. Just tossing this back out there... if anyone wants them, shoot me a PM. I hate to trash them, but I just don't have room to keep them any more. I use the RM7200 sats with a Velodyne sub in my shop......nice little rig. Someone needs to grab these. This needs to stay at the top of the sub. It would be wasteful to toss them. I would be in for at least the center if it is the gloss black setup. Prob under $25 to ship. @nooshinjohn I have to work the next 9 days when do you want me to come to get em? Should I stop by or slow down so you can throw them at me? thx @la2vegas if I were local it may be considered. Beer and eats ?? Must have lost my invitation to this shindig. Dang! I'm sorry I missed these.